Hours after he signed on the annexation of Crimea, Russian President Vladimir Putin spoke to Indian Prime Minister Manmohan Singh on Tuesday to brief the BRICS leader over Russia’s position on the current standoff. “Prime Minister expressed his hope that all sides would exercise restraint and work together constructively to find political and diplomatic solutions that protected the legitimate interests of all countries in the region and ensured long term peace and stability in Europe and beyond,” said a statement from the Indian Foreign Ministry. Putin and Singh also discussed the “special and privileged strategic partnership” between Moscow and New Delhi on Tuesday. In Tuesday’s address at the Kremlin, Putin thanked BRICS members India and China for their support to Russia during the crisis. “We are grateful to all those who understood our actions in Crimea. We are grateful to the people of China, whose leadership sees the situation in Crimea in all its historical and political integrity. We highly appreciate India’s restraint and objectivity,” said Putin. New Delhi has said earlier that Moscow has “legitimate” interests in Ukraine and they should be discussed to find a satisfactory solution to the issue. “We are watching what is happening in Ukraine with concern… The broader issues of reconciling various interests involved and there are, after all, legitimate Russian and other interests involved and we hope those are discussed, negotiated and there is a satisfactory resolution to them,” Indian National Security Advisor Shivshankar Menon said earlier this month. The Russian President seemed unfazed in the face of Western sanctions as he addressed a meeting in Moscow on Tuesday to mark the Crimea referendum results. “We are concerned over the developments in Ukraine. But I believe that Ukraine will overcome all the hardships. 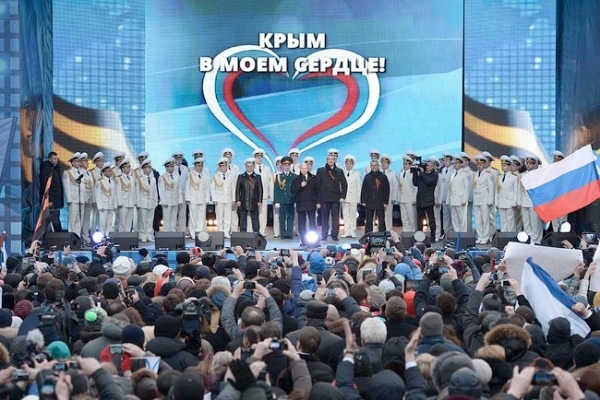 We are not just neighbours, we are close family and our future success depends on us, both Russia and Ukraine,” Putin said on Tuesday reaching out to Ukrainians even as the government in Kiev said it “will never recognize” Crimea’s status as a part of Russia.